Our adult squad runs in a 3 tiered training programme to allow all athletes to perform to their best. A solid coaching team ensures people are selected according to their ability and helps everyone to improve. The squad trains as a group in ergo sessions, weight sessions, circuits, running and water work. The squad is tested regularly throughout the year with 2000m and 5000m pieces to monitor progress and follows a programme that begins in October to develop strength, power and endurance. We have a wealth of experience in the coaching team who work with crews on a regular basis, setting the work plan and identifying areas for improvement. From time to time we invite guest coaches in to bring fresh ideas to both rowers and coaches alike. Racing takes place at both major national and smaller local events. We attend many races on the Cam each year including the famous Bumps races in which all squad members participate. 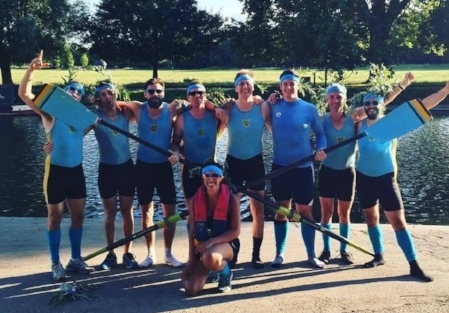 In recent years we have come top 50 at Head of the River, qualified for Henley Royal Regatta and had multiple wins at Metropolitan Regatta (including sculling). As a competitive squad we are always ready to welcome those looking to achieve success at a high level but we also welcome those new to the sport too. If you would like to join one of the strongest men’s teams in the region then please contact the Men’s Squad Captain. The women’s section of the club has seen spectacular growth in the last few years. In 2003 we took an eight to the WHORR for the first time in many years and finished 75th. In 2006 our entry had grown to three eights with both the first and second eight finishing within the top 50, something achieved by only 4 other non-student clubs. We now usually send two to three eights to the Women’s Head of the River. Like the men’s squad, we race at various national and local levels in both sweep and sculling events. We have a good team of three or four coaches and are lucky in that most outings are coached. We encourage as many as possible to take up sculling as well as sweep rowing and provide a carefully structured training plan each year. We are always looking for new members, whether experienced rowers, beginners or coxes. If you’re interested in joining the most exciting women’s squad in the region then please contact the Women’s Squad Captain.